An undisclosed injury has forced Amir Sadollah out of his UFC 143 scrap against Jorge Lopez. 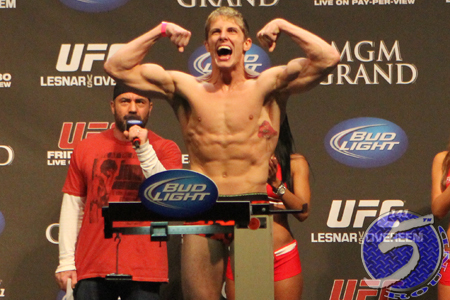 Welterweight Matt Riddle (Pictured), who had to withdraw from UFC 141 at the last-second due to illness, has agreed to serve as substitute. Riddle has lost two straight scraps and could be fighting for his Octagon life on February 4th. He was slated to meet Luis Ramos last Friday until he became sick after warmups. Lopez made his big league debut in September at “UFC Fight Night 25.” Wanderlei Silva’s protege had his 10-fight winning streak snapped by dropping a unanimous decision to Justin Edwards. The Mandalay Bay Events Center in Las Vegas, Nevada hosts the festivities. A interim welterweight title tilt between Nick Diaz and Carlos Condit headlines the pay-per-view broadcast.